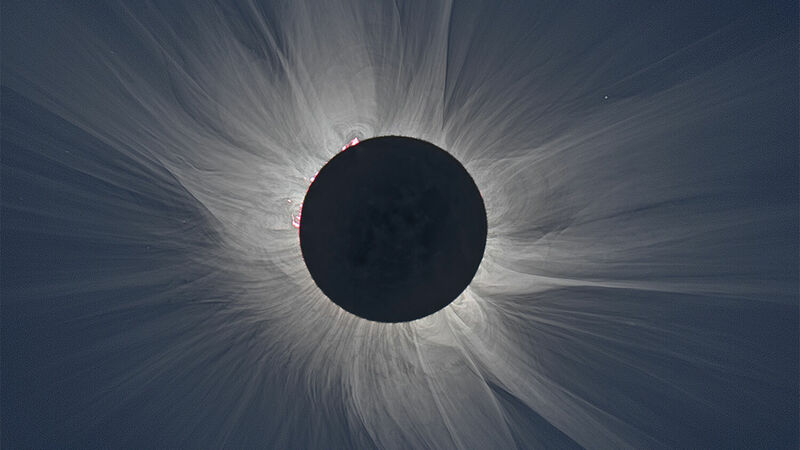 A white light image of the solar corona during totality. The event will mark the first solar eclipse to darken the U.S. mainland since 1979, and the first in 99 years to cross over the country from coast to coast. For sky-watchers observing from inside the moon’s shadow, it will be beyond spectacular. “It will stand out as one of the greatest—if not the greatest—sights you have or ever will behold,” said Astronomy magazine’s Michael Bakich. The event will also be the first-ever total solar eclipse with a path of totality exclusively inside the United States. Back in 1257, another one met this geographical standard, but that was centuries before the nation’s founding. Many hotels inside the eclipse’s path have been booked for years in anticipation of the event. Numerous schools and businesses in the path plan to shut down for the day to help students and employees witness the event. Utility managers on solar reliant power grids are already planning how they will keep the lights on during the rapid decrease and rally in sun power. And zoologists are as excited about the chance to study how their animals react to the event as they are about what will occur in the skies. Analysts calculate that it will be the most broadly observed, the most carefully studied, and the most photographed and filmed eclipse in all of human history. Yet even with all this fanfare and scrutiny, several prominent voices in the religious community say the eclipse deserves far more of the attention of America and the world—because it is a warning sign from God. Solar Eclipse: A Sign of the Apocalypse? Writing for Unsealed.org, Gary Ray says the eclipse may mean that 2017 will mark the beginning of the Tribulation, a time the Bible describes as a period of conflict and suffering on a scale never experienced in mankind’s history. Ray calls attention to the fact that another solar eclipse will occur seven years later, with a path that will slash across the U.S. in the opposite direction—from Texas up through Maine. The two paths together make an X over the United States. Ray believes the two eclipses could mark the start and ending of a seven-year period of tribulation, and that it is significant that the eclipses occur around sacred days on the Jewish calendar. “2017 to 2024 offers the only timeline in recent memory where the Tribulation of 2,550 days could begin unquestionably on a fall feast date and end on a fall feast date,” he says. Revelation 12 Sign = September 23, 2017 Alignment? The Internet’s vast array of articles and videos on these topics have been viewed by millions of religiously minded individuals. And although the writers and speakers generally allow themselves wiggle room—stressing that the eclipse could be or might be a heavenly signal—a significant percentage of their audience believes it is indeed an apocalyptic sign. The euphoria and rapture on display in the comments sections make this clear. Are these individuals right? Is it true that the August 21 eclipse is connected to biblically prophesied events? A full third of the Bible is dedicated to prophecy, meaning forecasts that tell what is to come. This is a percentage considerably larger than most Bible readers might imagine and shows that prophecy is vital for Bible students to study. It is true, as Begley points out, that a prophecy recorded in Joel 2:31 says “the sun shall be turned into darkness” just before the “Day of the Lord” begins. But if you place that future darkened sun on the timeline of biblically prophesied end-time events, it becomes clear that the Aug. 21, 2017, eclipse could not be the cosmic event Joel was discussing. The book of Revelation arranges the major end-time prophetic events in order of time sequence. Altogether, these three “world-shaking” events will last 3½ years—not seven. This duration is explained in the Revelation 12:14 mention of “a time, and times, and half a time.” Exchanging the word year for the word time in this passage makes the math and overall duration clear. Isaiah 34:8 allows calculation of the lengths of the individual sections within this 3½-year-long time block. This scripture shows that the Day of the Lord lasts one year long. The heavenly signs do not occupy a separate time block, at least not one of significant duration. So subtracting that one year from the total 3½ years leaves 2½ years for the length of the Great Tribulation. The first four seals discussed in Revelation 6:1-8 are counterfeit religion, war, famine and pestilence. These happen in the lead-up to the fifth seal, which is the 2½-year-long Great Tribulation. This time is described in numerous passages including Daniel 12:1, Matthew 24:21-22 and Revelation 6:9. These passages make clear that it will be a period of conflict and devastation on a scale never experienced in mankind’s history. Only after the Tribulation’s 2½ years have passed will the second event—the “heavenly signs”—occur. The Tribulation is the fifth seal, and the signs are the sixth. This time order of prophesied events makes plain that the upcoming August 21 eclipse is not one of the heavenly signs of end-time Bible prophecy. This time order of prophesied events makes plain that the upcoming August 21 eclipse is not one of the heavenly signs of end-time Bible prophecy. For the August 21 eclipse to be the darkened sun predicted in Joel 2:31, Revelation 6:12 and Matthew 24:29, the Great Tribulation would have had to begin 2½ years earlier—on or around Feb. 21, 2015. It is obvious to see that this did not happen. Is ‘Virgo’ Made By God? Also relevant to this discussion, and especially to Scott Clarke’s theory, is that the Zodiac constellations such as Virgo and Leo were not anthropomorphized, zoomorphized and given their modern names by the Creator God. Of course, God created the stars and grouped them together into constellations, as seen from Earth (Job 38:1, 31-33). But it was not God who decided that the configuration of stars between 152.75 and 180 degrees of celestial longitude look like a woman. It wasn’t Him who determined that the group spanning 120 to 150 degrees of celestial longitude have the appearance of a lion. And He did not name those groupings Virgo and Leo. To look at a group of stars and perceive a woman requires both imagination and pareidolia, a psychological phenomenon in which the mind fills in the blanks to see a familiar pattern where none actually exists. After removing the man-made lines that connect the dots, the star cluster commonly called Virgo looks as much like a salamander or a skydiver as it does a woman. After removing the man-made lines that connect the dots, the star cluster commonly called Virgo looks as much like a salamander or a skydiver as it does a woman. Under the course in which the planets move are situated, according to them, 30 stars, which they designate as “counseling gods”; of these, one half oversee the regions above the Earth and the other half those beneath the Earth, having under their purview the affairs of mankind and likewise those of the heavens …. Twelve of these gods, they say, hold chief authority, and to each of these the Chaldeans assign a month and one of the sign of the zodiac, as they are called. And through the midst of these signs, they say, both the sun and moon and the five planets make their course. One could not argue that the constellation of Virgo is the travailing woman of Revelation 12:1-5 without first proving that God had inspired the ancient Babylonians and/or Greeks to practice astrology, and to perceive a woman in that cluster of stars. That is not provable, and contrary to several biblical passages regarding astrology. For example, speaking through Moses in Deuteronomy 4:19, God forbids serving and worshiping the heavenly bodies. In chapter 18:10-14, He forbids divination, fortune telling and interpreting omens—all of which were often done by reading meaning into the constellations. The Prophet Daniel encountered astrologers in King Nebuchadnezzar’s court, and found them to be useless: “Then came in the magicians, the astrologers, the Chaldeans, and the soothsayers: and I told the dream before them; but they did not make known unto me the interpretation thereof” (Daniel 4:7). Some have feebly argued that since Job 26 says a constellation called the “crooked serpent” and other heavenly bodies are “parts of God’s ways” that it means the Creator uses the Zodiac to teach men about His plan. But it is important to note that after the long discussion between Job and his companions ends, God dismisses everything the men said during it—everything recorded in chapters 3 through 37, including Job’s “crooked serpent” statement—as “words without knowledge” (Job 38:1-2). Anyone able to witness the eclipse from within the path of totality is in for a knee-buckling, awe-inspiring, jaw-dropping, emotionally overwhelming and potentially life-changing experience. And it would be a shame to label the event a cosmic coincidence instead of seeing that “the glory of God” is declared by the intricate design of our solar system (Psalm 19:1). But there is no basis—in Bible prophecy or elsewhere—for the claims that the August 21 eclipse will begin the Tribulation, herald the Day of the Lord, signal Jesus Christ’s return, or otherwise mark a sign from God of the apocalypse. This article is not intended to belittle anyone, and the commentators mentioned above could be commended for their efforts to comprehend Bible prophecy. This spate of doomsday predictions surrounding the August 21 eclipse are only the latest round of attempts by men and women to interpret Bible prophecy. For untold centuries, individuals have endeavored to predict the future by reading their own meaning into Bible scriptures—but with an abysmal track record. That is because, as explained in 2 Peter 1:20, “no prophecy of the scripture is of any private interpretation.” But that does not mean the Bible’s prophecies are unreliable, or that it is impossible for you to understand them.